The Union City Lady Tigers traveled to Calumet in last nights game. The Lady Ti gers dominated in the game and won by a score of 9-4. Union City collected 12 hits. Kylie McCoy, Taytim Woods, Bereniz Pizano, and Megan Fairless all had multiple hits throughout the night. The Lady Tigers scored 7 runs in the third to take a 9-3 lead. Union City tore up the base paths. Taytim Woods stole 3 bases and added 3 hits on the evening. 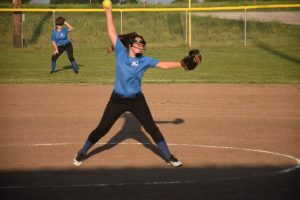 Eighth grader, Kaitlyn Linson toed the rubber and pitched a complete game. She struck out six and only allowed two hits all night. Union City will take a little over a week off and be back in action on Thursday, Sept. 6th at Geary beginning at 3:30.